AIMP is a powerful audio player that allows you to listen to your favorite music with an outstanding sound quality. Its appearance resembles that of another classical audio player (Winamp), so you'll get used to it very quickly. It can also be customized with skins. The program includes a 18-band equalizer, a visualization window to display rhythmic visual effects and a playlist editor to organize your audio files. A nice fading effect makes your list of songs look like an endless music loop and a handy volume normalizing feature avoids drastic volume changes between tracks. Also, the player's main functions can be conveniently controlled by global hotkeys. 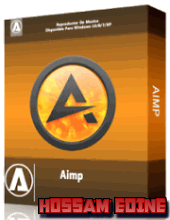 Besides playing music, AIMP features three extra utilities which also enable you to record any sound on your computer, convert audio files from one format to another and view or edit tags. AIMP is based on the well-known audio engine BASS, so it's easy to connect new plug-ins (from the plug-in library included in the program) and expand the player's functionalities.